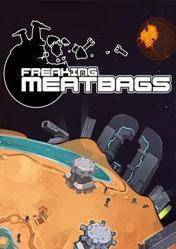 Freaking meatbags puts us squarely in a futuristic world where robots dominate society and humans are mere observers of robots, completely unnoticed. Like a cleaning humble robot , our task is to collect the precious materials of each world before the solar system explode. But you will soon realize that this work will not be as simple as expected. During the day our mission will be to gather resources , build structures and maintain our base in good condition. But when it gets dark, you will be ready to fight. There are no comments yet about Freaking Meatbags . You can be the first one!